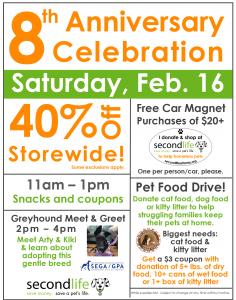 Join us for our 8 Year Anniversary Celebration on Saturday, February 16! It is because of YOU…that Second Life has been able to donate more than $1.2 million in grants to more than 60 animal rescues and spay/neuter programs. Check out our planned activities for the 8th Anniversary Celebration! All activities are while supplies last. All Day: Pet Food Drive for Pet Buddies Food Pantry. Donate 5+ lbs of dry food, 10+ cans of canned food or 1 box of kitty litter and receive a $3 off coupon (for use on another day). Cat food and kitty litter are especially needed. 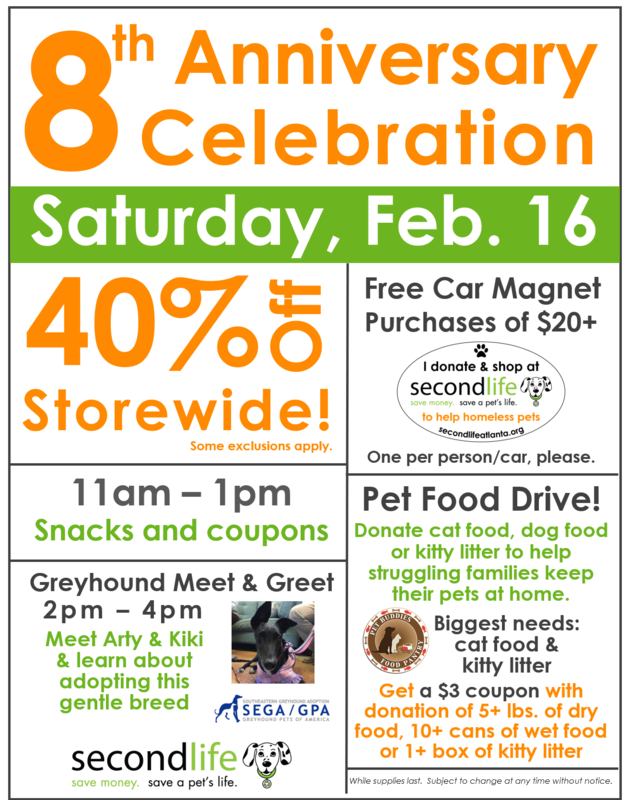 All Day: Free Car Magnet Spend $20 or more in one transaction, and receive a free Second Life car magnet to help promote our mission of helping homless pets! 11am – 1pm: Coupon giveaways with each purchase. 2pm – 4pm: Greyhound Meet and Greet: Meet Kiki and Arty, ambassadors for Southeastern Greyhound Adoption – GPA Atlanta. Learn about adopting this adorable breed. Visit our Facebook Event page to add it to your calendar. Save big in both stores with our monthly 40% off sale. It’s generally the 3rd Saturday of the month, but can change…so make sure to check our home page. It’s a great day to stock up and save! Open 11am – 6pm. Our stores are generally very busy from 11am-2pm on these sale days. If you prefer a more casual shopping experience, we suggest you come after 2pm. Depending on weather, they are outside or inside our Furniture, Decor & More store.There’s so much to know about these special dogs and no better folks to learn from than. While Arty and Kiki , aren’t up for adoption, you can learn more about this wonderful breed and SEGA can tell you about dogs that are available to good homes.